We share this passion for responsibly grown food through our pizzas, salads, soups, and more. ♦ Source from local, organic, sustainable growers and suppliers ♦ Recycle the paper, glass, plastic, and metal we use to minimize our landfill contribution ♦ Compost food scraps and paper hand towels to reduce environmental impact and bring nutrients to the soil ♦ Promise our community and ourselves: Continually strive to do more! ♦ To-Go utensils, cups, lids, straws, napkins, containers and bags are made from renewable resources, compostable materials and are biodegradable ♦ Gift Cards are 100% recycled PVC ♦ Paper menus, gift card holders, business cards and posters are made from recycled paper, agra-based inks and wind power ♦ Receipt paper is BPA free ♦ Patio furniture is made from soda bottles ♦ Dining room tables were manufacturing remnants ♦ Glasses you sip from are recycled wine bottles ♦ Mismatched silverware is donated from customers kitchen drawers ♦ Mismatched employee shirts are donated for reuse by our customers ♦ Crayons are made from unwanted crayons collected by Crazy Crayon LLC and melted for reuse. Jeff has over 25 years of restaurant experience. He is a graduate of DU (Denver University.) The idea for Sazza was planted in 2004 and by June 2006 Sazza opened its doors in Cherry Hills Marketplace. Jeff’s outgoing personality is seen on many days/evenings at our Cherry Hills Marketplace or Stanley Marketplace location. When he is not at Sazza he is busy with his Two boys Izzak & Sam. My favorite Sazza Drink: Left Hand Nitro Stout, it is a beautifully dark, rich and smooth beer that you can pour upside-down like a monster. My favorite Sazza Pizza: Cheeseburger. I think all hamburgers should come on a pizza. Why I work at Sazza: I enjoy making a connection with people over the food I truly enjoy and believe in. After working in corporate restaurants where I never really cared about the people, food or even the bigger picture this has been an awesome change of scenery for me. Oh and it is extremely close to my house. My favorite Sazza Drink: Ramona is my new fav! But I also like our fresh-squeezed lemonade to go along with all the sunny hot days in CO! My favorite Sazza Pizza/Salad: Primo and BBQ Chicken on our ancient grain crust. Solstice is my go-to salad and the Spinach with goat cheese is awesome! 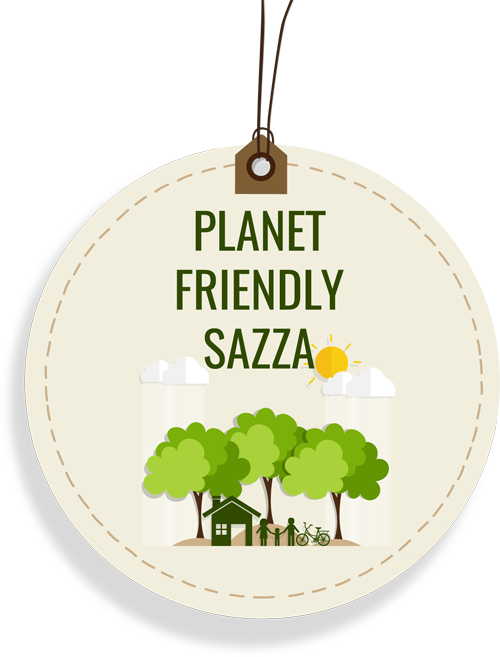 Why I work at Sazza: I’ve been into environmental practices since grade school and have pursued ‘green’ positions throughout my working career. I’ve worked on invasive species projects, taught environmental education/agriculture practices abroad in Peace Corps, and worked in companies with green policies and pursuits. After moving to CO from WI, I was drawn to Sazza because of all of the above and I feel good about working somewhere that parallel’s my philosophy.